Our Chocolate Crème Logic Smoke e Liquid is similar to the flavor of our rich chocolate e liquid flavor with the added taste of crème. This is a yummy cup of cocoa on a cold winter day, or a delicious bowl of chocolate ice cream on a hot summer day. 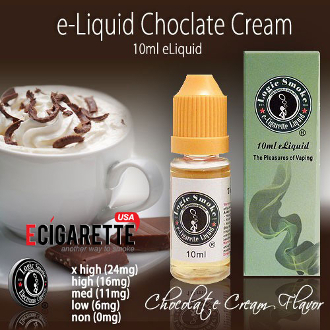 Whatever memories this flavor brings to you; you will thoroughly enjoy our Chocolate Crème Logic Smoke E-liquid. The 10ml bottle is a convenient and economical size for purchasing in quantity. Fill your clearomizer or other e liquid atomizing device directly from the bottle or use it to refill your smaller travel-size e liquid bottles. You'll be ready and have liquid on-the-go at any time.